Santa Monica's streets are about to get a little greener. On Thursday, Nov. 12, the city's Breeze Bike Share program will officially launch, and people will be allowed to try out the bikes for free from 6 a.m. to 10 p.m.
Festivities start at 8:15 a.m. in front of Santa Monica's City Hall and will be followed soon after with a "Breeze Send-Off," with 200 of the green bicycles taking off to officially mark the start of the program. According to Santa Monica Next the program had a soft launch in August with only seven hubs and 30 bikes. While that trial run was only supposed to last about a month, they were so popular with the test riders that CycleHop, the program's operator, expanded it into the end of October. Once it's fully operational on Nov. 12, the whole system will have 79 hubs (where people can pick up and return bikes) and 500 bikes. Users will be able to buy basic plans on a per ride, monthly, or yearly basis. 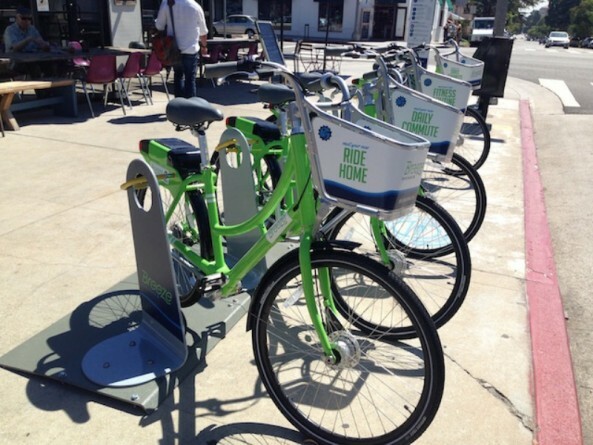 Earlier this month, the city signed a 5-year agreement with Santa Monica-based Hulu which will provide the bike-share program with $675,000 per year. Aside from operating costs, they money might also go towards "helmet dispensing kiosks" at each hub, according to Curbed L.A. Although the press release from the city of Santa Monica says riders can use the Breeze bikes for free on Nov. 12, it's not clear on the program's website how to register for that. We contacted Breeze Bikes about registration, but have not heard back yet. 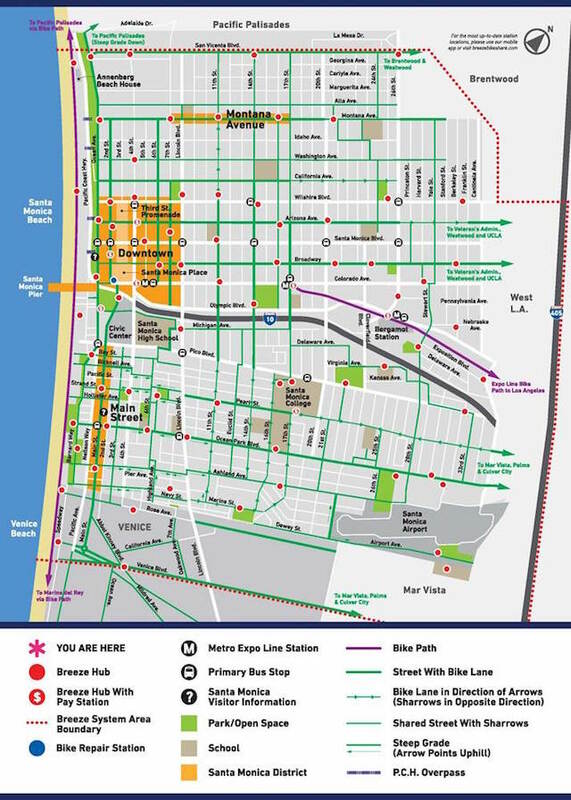 Update, 4:45 p.m.: Carrie Lujan, Public Information Coordinator for the City of Santa Monica, says the link will up as soon as possible and that it will make it "very easy for people to register" to ride the Breeze bikes for free on November 12.